Earlier this Spring, Phase I of the Collections Care Preservation Fund's Born Digital Survey came to a conclusion with the completion of the physical inventory, and programmatic examination of the participating units. The roughly eight month project yielded a number of results that will help the Institution better understand the scope of born digital collections materials in its repositories. However, the completion of this initial phase also serves as a strong reminder that there is still much more work to be done. 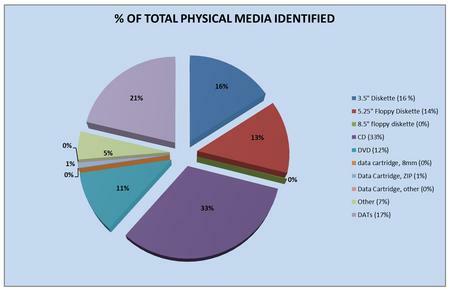 A major component of the physical inventory was a basic condition assessment of each piece of identified media. A simple scale was used whereby items were given a score of 1-5, with "1-No visible damage" constituting the best possible outcome. 99% of items scored a 1, with less than 200 items being identified as containing some minor or major visible or physical damage. The majority of issues were scratches on optical discs, or problems with how the media was stored. Another issue encountered was the "bubbling" of adhesive labels on CDs and DVDs. This is a common problem and can prevent the media from being read. Along with the work that remains to stabilize and properly manage the items identified during this survey, the Smithsonian as a whole should be expecting their born digital collections to continue to grow at a significant rate each year. Over the past five years, a sharp increase in these types of collections material has been observed, and with the digital age continuing to thrive, the possibility of exponential growth is genuine. Upon a basic review of the material being accessioned in the last couple years, discussions with both collecting specialists and archivists from SI units, and with an eye on current ongoing projects across the Smithsonian, future acquisitions of born digital material will likely include a large percentage of digital images, digital video, and computer aided design (CAD) files. While images have been coming to the archival units for some time, the advances in digital video have already begun to present a new set of challenges for repositories due to their complex nature and large file sizes. In the same respect, construction projects around the Institution generate a sizeable amount of CAD files that present equally unique challenges. In the end, the execution of this survey also helped lay the foundation for future work to be performed, as well as creating a greater awareness of born digital materials, and the proper ways to manage them. Through in-depth discussions between the contractor and staff members at the participating units, the general understanding of basic best practices for born digital collections material has improved, as well as the level of overall care and consideration for current holdings and the future additions. Eventually, we are hopeful that these materials will no longer be limited to a simple physical item description as floppy disks, DVDs, CD‐ROMs, flash drives, hard drives, and other physical media, but instead as digital photographs, letters, drawings, blueprints and plans, diary entries, speeches, lectures, interviews, videos, research data, emails, and other collection material, that happen to be in digital form. Not only will this be keeping with basic archival descriptive principles, but it will also provide these historical records the attention they deserve, allow for greater accessibility, and for long term preservation.